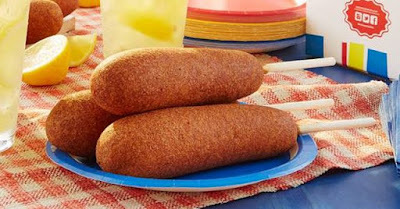 Hot Dog on a Stick is offering a deal this month where you can get their Original Turkey Dogs corn dogs for $1 a piece on every Tuesday in July. Additionally, they'll be giving out free corn dogs on National Hot Dog Day, Wednesday, July 19, 2017, at participating locations. There's no limit on the $1 Tuesday pricing but you are limited to one free Original Turkey Dog per person during the July 19th giveaway. Original Turkey Dogs normally sell for around $3. Photo via Hot Dog on a Stick.